Retrieving is used both in obedience and in gun dog work. 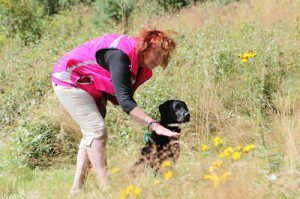 on this page we will focus on the gun dog retrieving and describe the different parts of retriever and spaniel field trials. 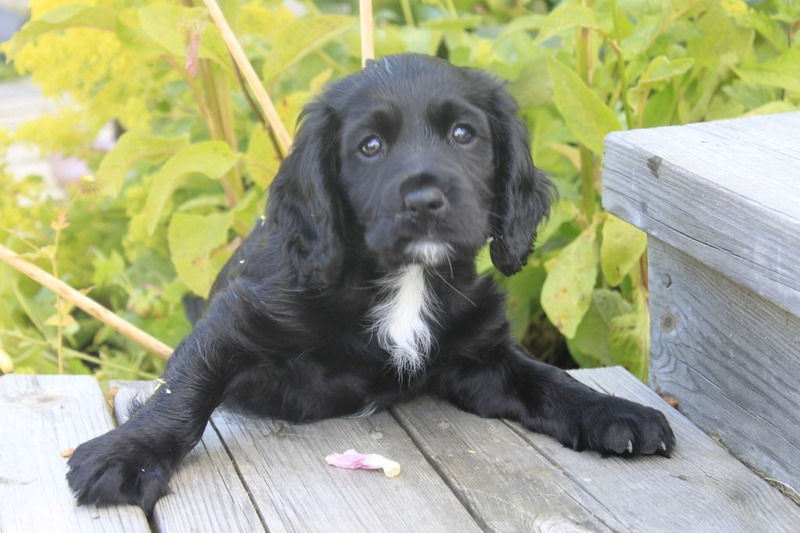 The spaniels and retrieves are found in the Sporting group (American Kennel Club) and the Gundog group (Brittish Kennel Club). They are, as the name says, retrieving (retrievers) and flushing (spaniels) dog used when hunting small game such as pheasant, partridge, hare and other small fowl. They might also be used when hunting vermin such as crows and sea gulls. When you do a marked retrieve both the dog and you can see the game (or the dummy) fall, and the dog should on your cue run to the object, take it and deliver it to you. A dog that is good at marked retrieves makes the job look very easy. The dog runs just straight out, takes the object, and comes back again without having to run around and hunt for it. 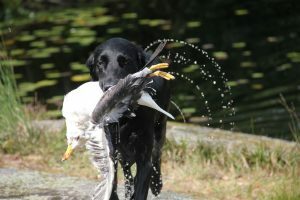 Marked retrieves occur both on land and in water when you do gun dog retrieving. There are single marked retrieves, double marked retrieves, and sometimes also triple marked retrieves. 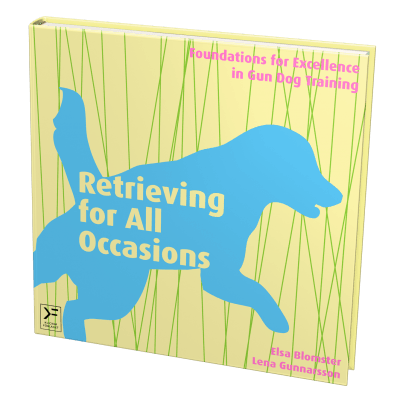 Double marked retrieves and triple marked retrieves means that the dog sees two or three objects fall to the ground, then she is sent to fetch one object and retrieve that object before she is sent to fetch the next one and so on. 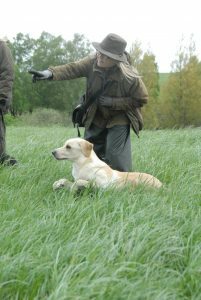 In the gun dog retrieving it is important that you can send the dog to the place where you want your dog to go. When you do blind retrieves you as a handler know where the game or dummy is and you should be able to send your dog to that place. 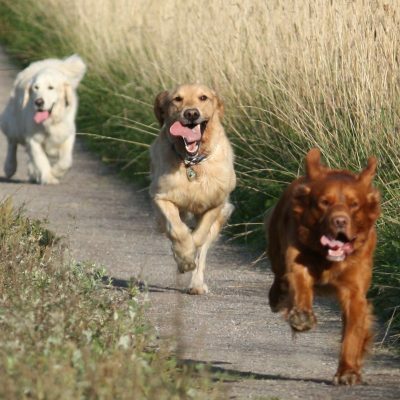 The dog should be able to run straight ahead, to the left, and to the right, further back (push back), and stop when you blow your stop whistle. More over your dog needs to know the hunt whistle, which means that when your dog hears that sound she should start to hunt for game or dummies in the area where she is. There are also blind retrieves in water that you have to send your dog to retrieve. In the water, it is often more difficult to direct the dog because it takes longer time for her to turn around and it is harder to stop the dog, if she is swimming in the wrong direction. Spaniels and retrievers hunt in different ways. Spaniels hunt closely to their handler – they quarter (crisscross or circle) in front of the handler. Spaniels adapt their hunt after wind and terrain. The zigzag pattern is not a goal in itself, instead the important thing is that the whole ground is scanned. When the spaniel finds game she flushes it (so that the animal flies up or runs away) and then the animal can be shot. 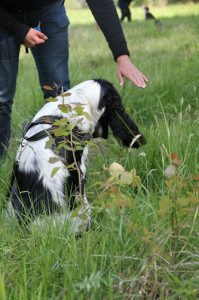 When game is flushed the spaniel should stop and remain on the spot – steadiness is vital for the spaniel. After the game is shot the spaniel should retrieve it on the handler’s cue. 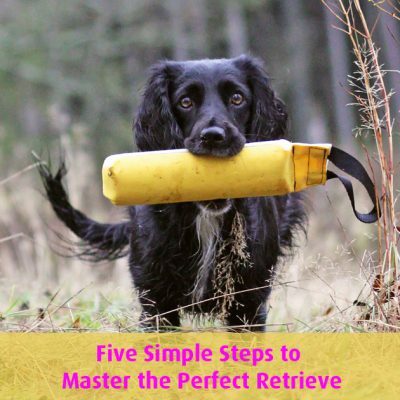 Retrievers work only after the shot and should then retrieve the game to the handler. 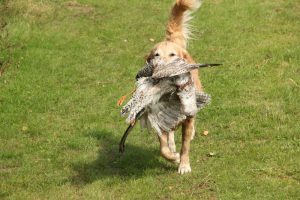 Unlike the spaniel the retriever should be able to independently hunt in a large area and retrieve game to the handler. In official field trails in Sweden they always use either warm game (shot during the hunt) or cold game (shot before the field trail), but that can vary from country to country. In some countries the sweeping up is part of the field trial and in some it’s not. 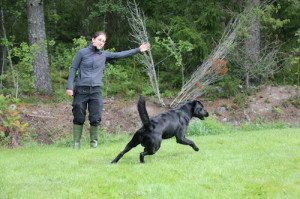 Between the different exercises, and sometimes also during them, the dog should be at the handler’s side. Retrievers usually walk at the handler’s left side, while a spaniel either walks at the handler’s left side or just stay around the handler. The dog must be steady, that means not leave the handler without permission. When the dog doesn’t work – is passive – she must be calm and quiet. A spaniel must also, as mentioned above, be steady when birds fly up. In other words, the demands are very high on the dog during the hunt, field trials, and gun dog training. During the hunt and on field trials, the dog should be as quiet and unobtrusive as possible. Hand signs, signals from the whistle, or verbal cues may be combined in different ways, and there are no rules saying that you have to use a certain signal or that a behavior has to be done in a certain way. 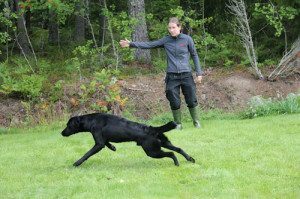 Contrary of the obedience competitions, you may move around and do a lot of visible hand signs during the gun dog training. If the dog is far away it may for instance be useful to move to the right, when you send your dog to the right, so that she clearly can see the sign. Stop (the stop whistle) – usually one short or one long signal. You choose whether the dog should stand or sit after the stop whistle. Come (the recall whistle) – usually several short signals. Hunting in a small area / holding an area (the hunt whistle) – usually a kind of rolling signal like “duduuuu. Duduuuu”. Turn/hunt towards me (mostly used for spaniels) – usually one or two short signals. 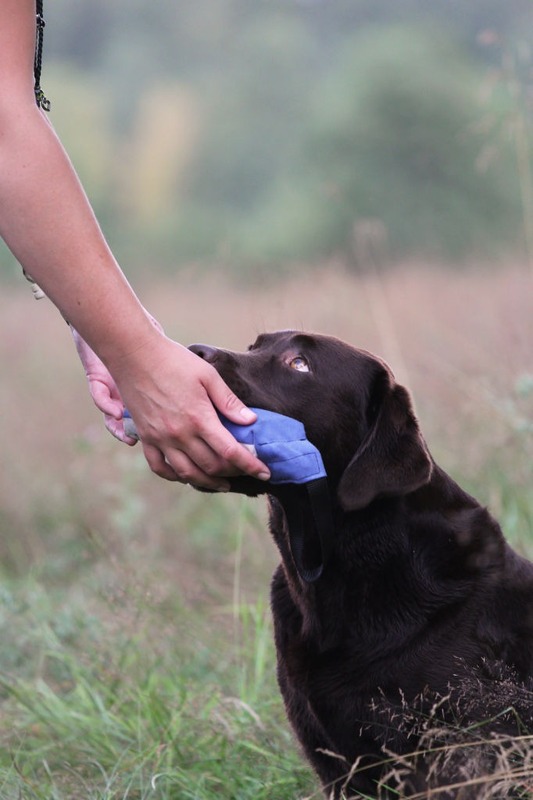 As a backup, it is good to be able to use your voice instead of the whistle so that the dog knows verbal cues such as “stop”, “come”, and “hunt”. One arm straight up in the air when the dog should stop (at the same time you blow the stop whistle). Both arms straight out from your sides (and blow the recall whistle). The hand sign for the retriever to hunt a larger area (picking up) – one hand at the same level as the dog’s eyes points straight out to the area where the dog should hunt. The hand sign for the spaniel to hunt – one hand points and the body turns in the direction where the dog should hunt. Signs for sending your dog to the right or left – right hand to the right and left hand to the left to direct the dog in the two different directions. Use the hand sign along with a verbal cue such as “left” and “right” or “that way” and “yes”. 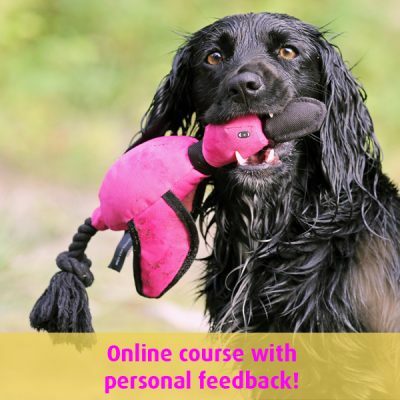 To send the dog straight ahead – one hand where the dog can see it/take direction from it when she sits next to the handler and combine that with a verbal cue when the dog should run off such as “yes”, “get back” or “out”. 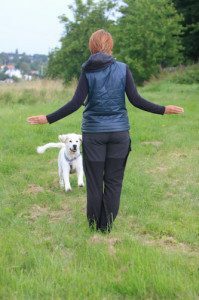 To send the dog further away straight ahead – which often is called “push back” – one or two hands over your head are moved towards the dog at the same time as the you says a verbal cue such as “out” so that the dog turns in the other direction and runs further away from you. To hunt an area in different directions. Once you have stopped the dog at a distance from you, and the dog is looking at you, it is good to be able to show the dog on which side she should be hunting. 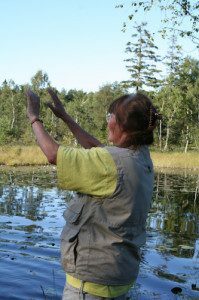 If you blow the hunt whistle and point to your right, the dog should hunt on her left side. If you blow the hunt whistle and point to your left, the dog should hunt to her right.